Glad you're enjoying your doripake! Hopefully mine won't turn out terrible haha. I'm hoping the Team Suzuki steering wipers give me enough angle for the 2.3cs ratio I want to run. I'm going for a slow drifting, high angle, fun car with this car. I figure my Doripake will come out on the heavier end of the scale as well. Have you ever seen anyone run the Team Suzuki Aluminum Chassis? I have been thinking of maybe making an eventual swap to that for a very stiff chassis, interested to hear your thoughts on it if you ever ran across one while in Japan. 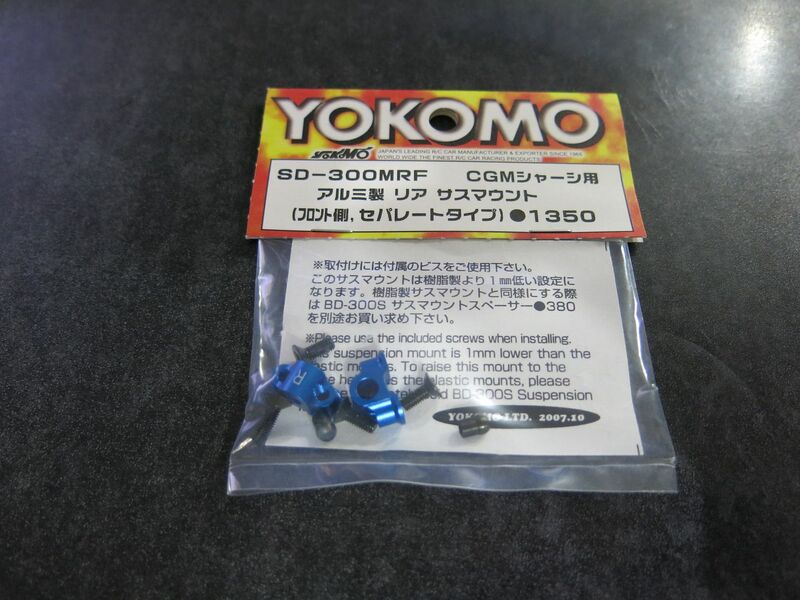 I'm going to stick to my Yokomo aluminum drive cups as well for now, just purchased them. I'm definitely interested to see the design of the Overdose motor mount though. The DIB chassis flex... it took me a lot of trial and error to get my DIB running decently. It drifted horribly for a while, and I got pretty frustrated. I figure your 275mm conversion has even more chassis flex? I'm still quite not happy with my setup, it can use a little more tuning, but it's real close to where I want it now. I am definitely going to try playing around with your method of body weights once I get the car a little more dialed in. I run in a tight area, so it'll be worth trying out! I think the chassis is West Mountain. Gearboxes are definitely so. Option #1 also do a full alloy type copied C these days. for 70000yen!!!! 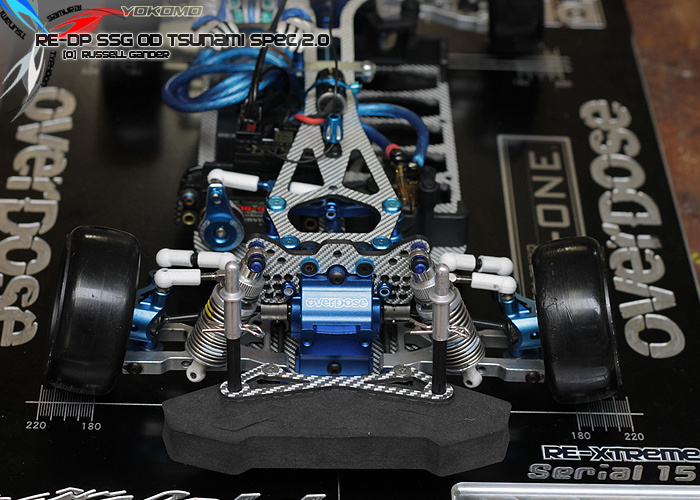 The only thing that lets down this chassis is the Futaba 3pk. It's just not good enough. That pink car looks awesome! I wonder if it's the same chassis, it looks like a de-anodized aluminum chassis from Team Suzuki, unless the chassis is listed under the wrong manufacturer on this website. Hmmm, I may just go full alloy then... I run a Sanwa MT-4, I think the response time on it will be good enough, coupled with a good receiver, and servo. I think I've got a pretty good idea of what direction I want to go with the drift package now. Yes, Options are a waste, but look so good. That must be the same chassis, but can you get it? 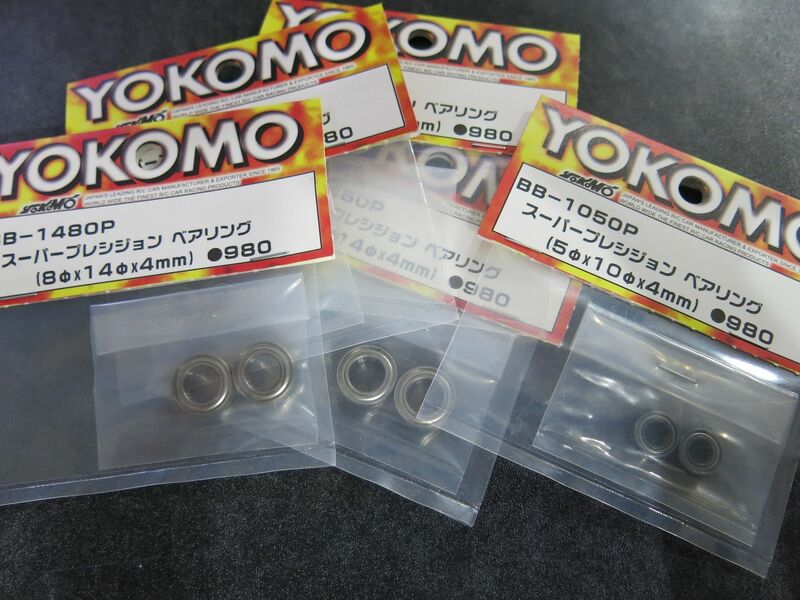 M's alloy parts are available too. 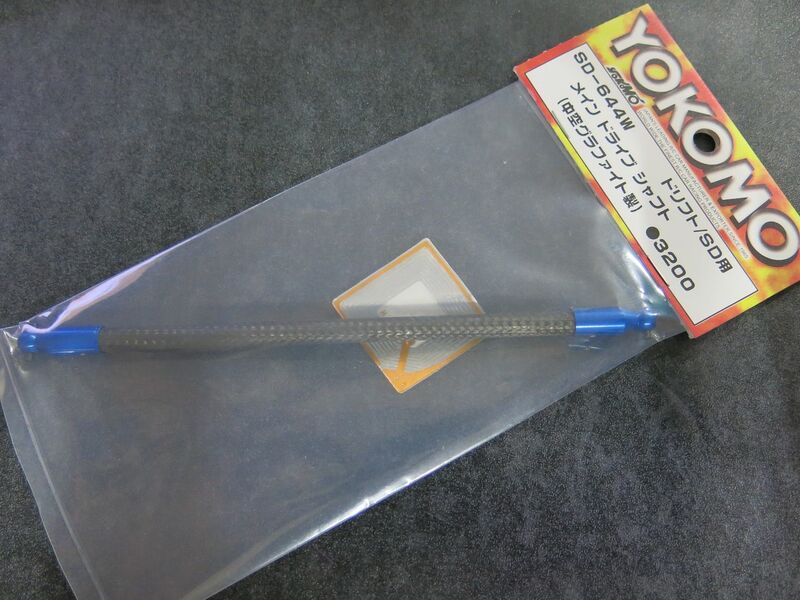 You can get the Option Number one chassis plate for 14490 yen I think. http://www.option-no1.com/catalog/pdf/td10-parts.pdf Page 3 has the chassis. I have a SRG-BL that is too fast. I have to slow down the curve. 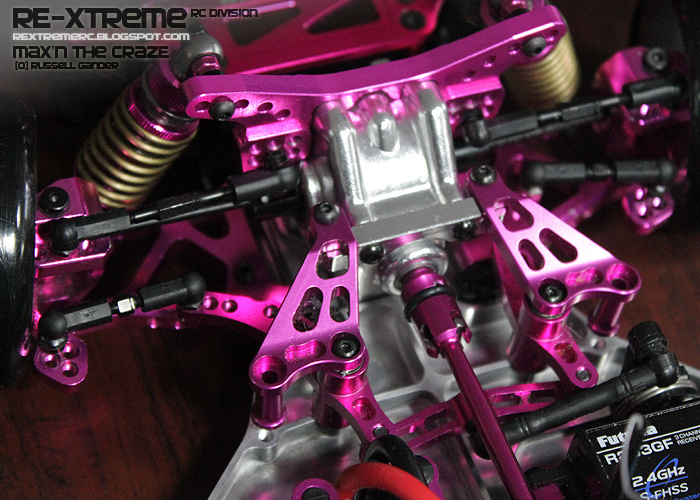 I agree with the option parts lol, a lot of them are just for that bling factor, but modding a chassis to not only perform better, but look just as good is one of the things I love about this hobby. That's crazy, I believe the SRG-BL is one of the fastest servos on the market when paired with the latest receivers from Sanwa (correct me if I'm wrong)~ I currently run a Savox 1251mg servo, and it's been doing the job for me. It's not so fast that I need to tune down the curve, but they are quite power hungry! remember those Option #1 parts are the same as R2 stuff. Quality may not be up there. When you tighten screws and stuff the alloy may be soft. It's fast in SSR mode, but basically the steering geometry is main thing for speed. I changed to the OTA-R steering on it, and bang! so fast i couldn't believe the difference! The steering on my Drift package is fast with the new wipers. The blacked out wires really make a big difference, looks great Russ. I was thinking about trying out some mesh sleeving, but that liquid electrical tape might be the way to go! I have a bit of binding in my steering when I built it. It shouldn't take much to fix it, I just haven't had any time to work on any of the cars recently due to school. Hopefully I can get it turning nice and smooth too! I received a few more parts for the Type-C today.. The shock towers and Type-C upper suspension mounts should be released any time now. I had them reserved for me already. I didn't think they'd work, but when I previewed the message they showed up.